Close Reading is something we all should be doing with Common Core but don’t always know how to implement because it’s so tedious. It’s being able to figure out what a challenging text means with little front loading. 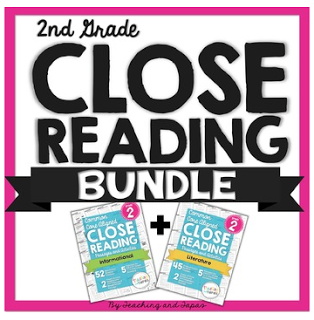 It’s reading closely and with a purpose You may be wondering, how can I get my first and second graders to close read when some of them can’t read at all??? And to be honest, it’s not very exciting as some of the other awesome things you’re doing in your class so it’s easy to feel unsure about it. It’s so easy to feel out of your comfort zone with close reading because parts of it (like not front loading vocabulary anymore) feels uncomfortable. I want to share a few things that have been working in my second grade class. 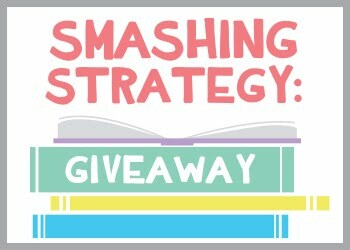 I’m creating a 5-part Close Reading Series to help you get more comfortable with it in your classroom. 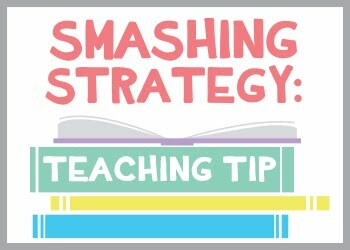 Once you get the hang of it, you’ll see how powerful and beneficial it is for your students. 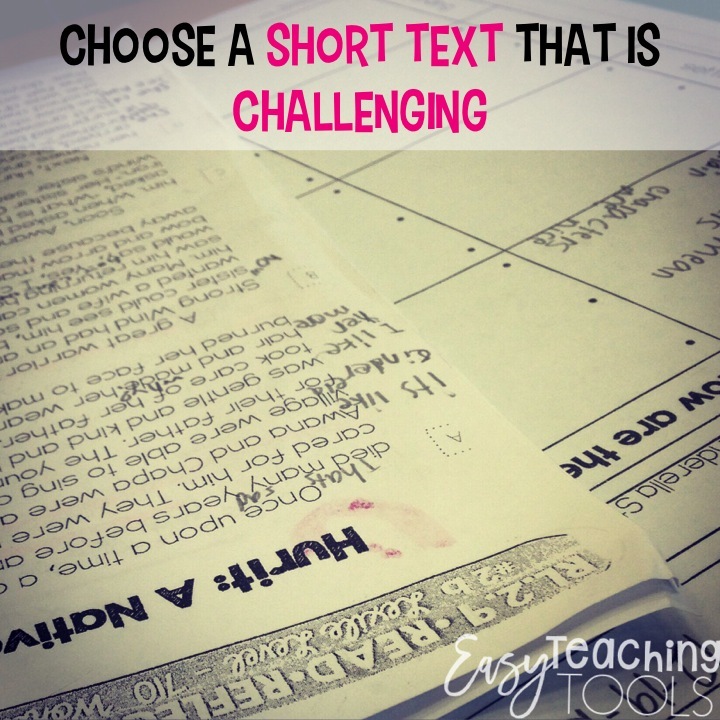 Because I know students will struggle productively, you want to choose a short text so that your students aren’t overwhelmed. I stick to one page of text. 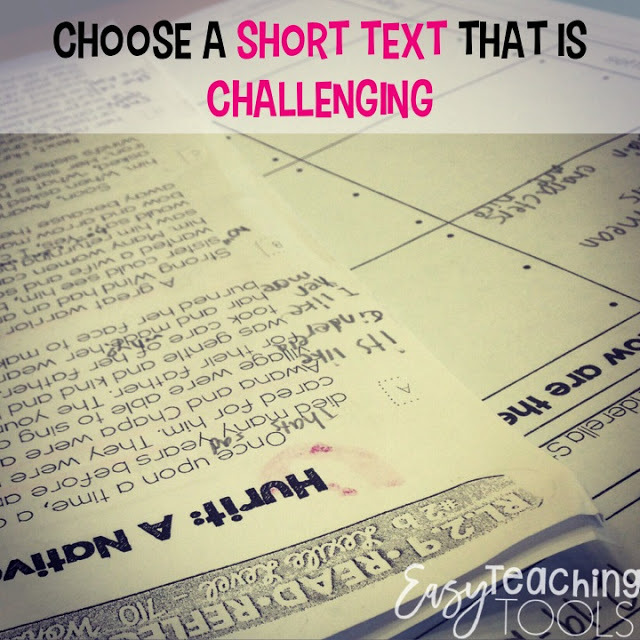 Be purposeful with the text you are choosing and make it relate to what you are studying in class. Choose something your students will be interested in. Just last month, we were comparing two versions of the same text so naturally, I chose two rigorous fairytales for my students to compare. When choosing text, analyze why it’s complex. Is it the lay out, the vocabulary, the sentence structure? Think what will make it challenging for your students and focus on that! We typically do our close reading as a whole class. But, my low or non-readers aren’t ready for this just yet so we’ll get started during guided reading. In 2nd grade, students are expected to read between lexile 450-620 at the end of the year. So, I typically choose texts that are above 650 because I know it will be challenging. This can be scary for younger kiddos or struggling readers who are below a lexile of 400, so your job is to support them and facilitate the process without guiding too much. One way I facilitate the process is by leveling our library so my students are working toward their end of the year goal. I don’t have a ton of extra time to create or search for passages so I swear by Teaching and Tapas Close Reading passages that are organized by standard and have such amazing questions that really make the students think. 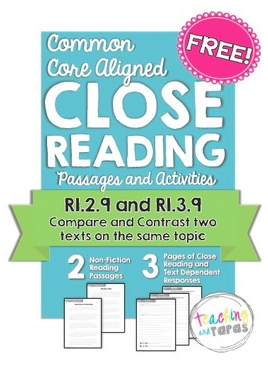 These have everything you need for a successful close reading lesson. In our class, we “Read With a Pencil.” It’s encouraged by Fisher and Frey, the close reading gurus. During the first read, I read the story to my group. This is perfectly ok for K-2. Since the text is meaty, I will read one paragraph at a time. 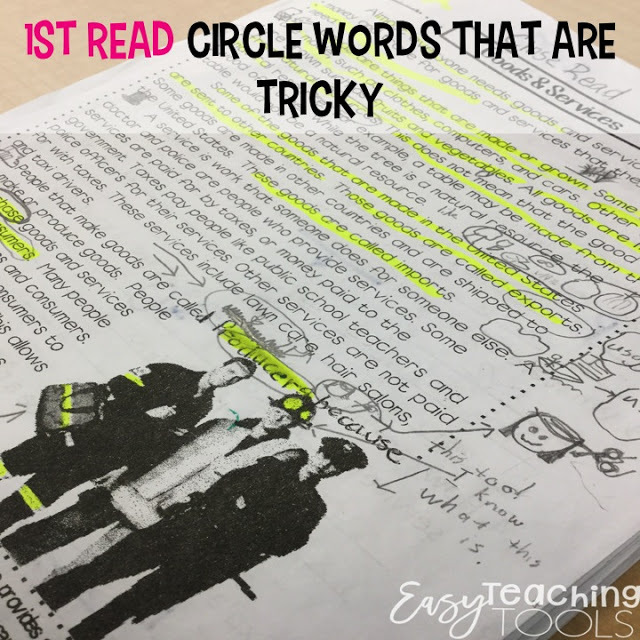 As I’m reading, kiddos circle confusing words and phrases. This is especially important for your English Language Learners (EL). Before, we would activate their schema and go over vocabulary before reading. Not anymore! This was so very much out of my comfort zone as a teacher. Stick with it though! Once students are done circling any tricky words in the first paragraph, they share out the words they were unsure of. This is where the collaboration comes in! Students love being the teacher and sharing what the word actually means. Then, I have the students draw a picture next to the word to remind them what it means. What if that doesn’t work and no one knows what the word means. We begin looking at context clues. In our class, kiddos know to read the sentence again. Then, we’ll read the sentence before it and the sentence after it. We repeat this process for the entire text. Like I’ve said, it is tedious and they’re little brains are going to hurt. This whole process should take about 15 minutes so if you notice that your friends are struggling or it’s taking later, come back to it tomorrow. That’s ok. 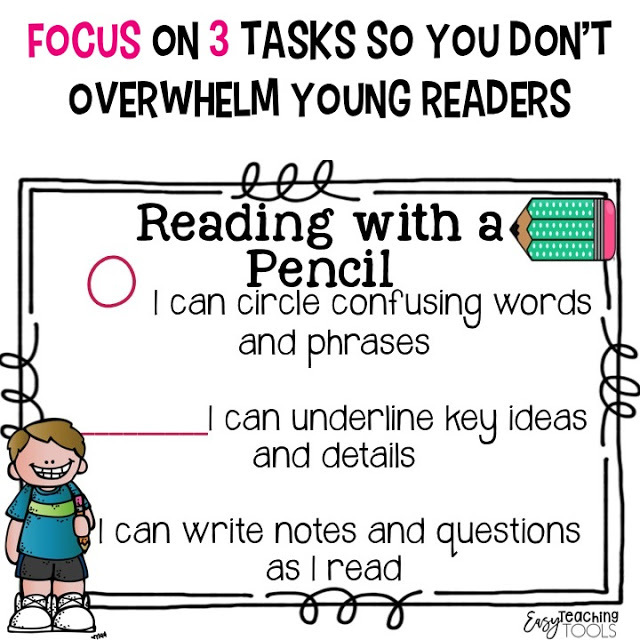 Remember, the goal is for them to read closely and if it gets to be too long, they’ll tune out. Check back next week as I’ll be sharing about what we do for the 2nd and 3rd read and how you can make it more interactive and fun! Are you looking for more research or info? 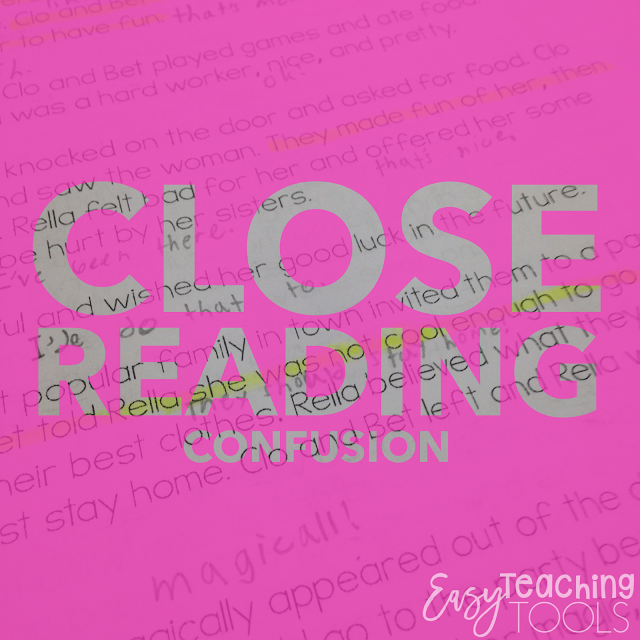 Check out these great Close Reading Resources. Want to try out Reading with a Pencil in your class. Get it for free! 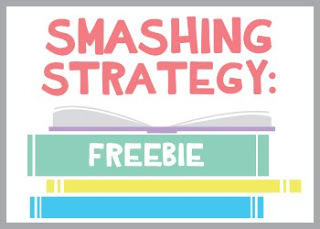 I want to make close reading easier for you. This bundle has not only made the entire process easier, but made me look awesome in front of my principal because she was blown away by the rigor! Thank you Kristen for explaining how students need a "purposeful struggle". I was so used to front loading and activating prior knowledge. It's such a new way of teaching for me. 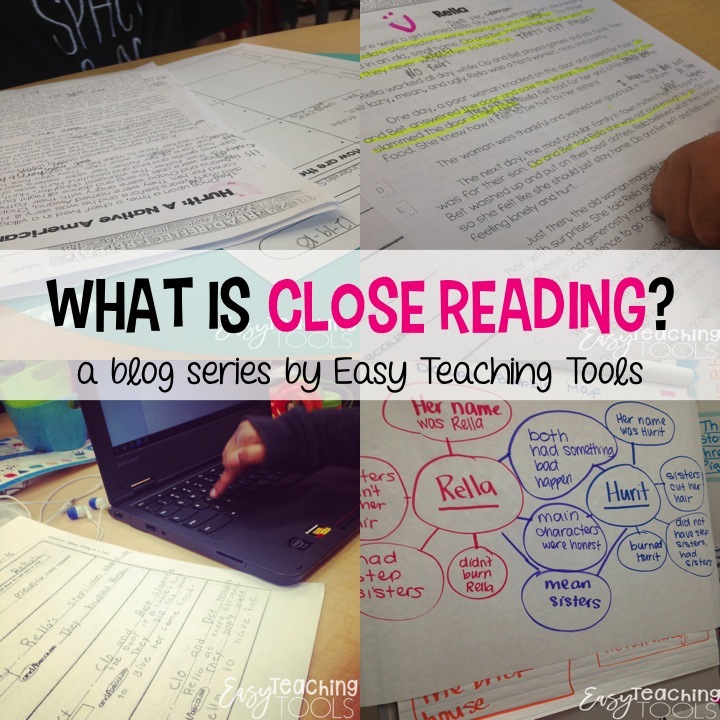 Your 5 week blog series on Close Reading is authentic PD for me! Thank you, Cheryl! A purposeful struggle is so new to many of us so it's a bit uncomfortable for everyone! I'm glad this series will be helpful for you! Why don't you front load anymore? When will the second post go live? I'm loving this! Love this! Why are there no longer links to Week 4 and 5? I was so looking forward to reading them!